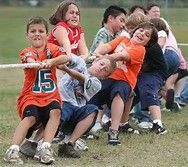 Manila tug of war rope is the only type allowed by the Tug of War International Federation. Excellent for Adult or Child activities. Perfect for Picnics, School Functions, Reunions, or any event where fun and excitement is included.